Maximize your chances of viewing wildlife in Chobe National Park on this full-day excursion from Victoria Falls. 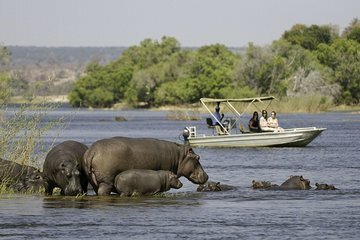 Take a safari through the park and cruise down the Chobe River with a guide for the opportunity to see native wildlife like big cats and tropical birds in their natural habitat. Begin your day trip to Chobe National Park with pickup from your Victoria Falls hotel in Zambia or Zimbabwe prior to 5 a.m. The early morning departure ensures the best opportunities for viewing big cats and other nocturnal animals during the hourlong drive to the border through Zambezi National Park. Upon arrival at Chobe National Park at roughly 6:30 a.m., embark on a game drive through the park. Your guide will help you spot native wildlife, including game cats, in their natural environment. Eat lunch at the Chobe Safari Lodge around noon, and then enjoy free time relaxing in the shade before a 3-hour boat cruise on the Chobe River. Look out for birds and other wildlife throughout the cruise, which ends with a view of the sunset over the river. Return to your Victoria Falls hotel in Zambia or Zimbabwe by about 8 p.m. Please note: A minimum of four people per booking is required. Early trip, 5 am pick up at hotel. This allowed for more time in Chobe for animal viewing. Very worthwhile! This was June, winter, so dress warm for open jeep trip in to park and early viewing as temperatures can be cool! Vehicle by operator not as nice as others we saw in park, but adequate. Lunch stop good, but too long a wait prior to the boat trip. However, boat trip was spectacular! Lots of hippo and elephant and ending with sunset views from the river. Worth the price for sure.